Last year marked the first time Melbourne has hosted an exhibition dedicated entirely to famed Dutch graphic artist M.C. Escher. In December, the National Gallery of Victoria (NGV) opened Escher X nendo: Between Two Worlds, which will run until this April. Born in, Leeuwarden, in the Netherlands, in 1898, Maurits Cornelis Escher made some of the most iconic prints of the twentieth century. The NGV is showcasing around 150 of his mathematically-inspired masterpieces, which are immersed in visual installations of works by acclaimed Japanese design studio nendo. In this fusion of talent, nendo’s works represent an innovative response to Escher’s ideas. “We often look for ways to present exhibitions in a new format and given our interest in design, we felt there were aspects of Escher’s work that the nendo design studio would correlate very well with,” exhibition curator Cathy Leahy explained. The exhibition has received rave reviews from both Escher experts and visitors who had no prior knowledge of the talented artist. “It’s more of an experience that is hard to put into words,” Leahy said. Leahy noted that visitors seem particularly fascinated by the artist’s lesser know pieces, which are inspired by Italian locations such as the Amalfi Coast, San Gimignano, Calabria and Sicily. Escher moved to Italy in 1922, where he travelled extensively, drawing from nature and perfecting his technique. He fell in love with the beauty of the Italian landscape and also met his wife Jetta in the Belpaese. It was the most productive phase of the artist’s career, during which he dedicated himself entirely to graphic art. 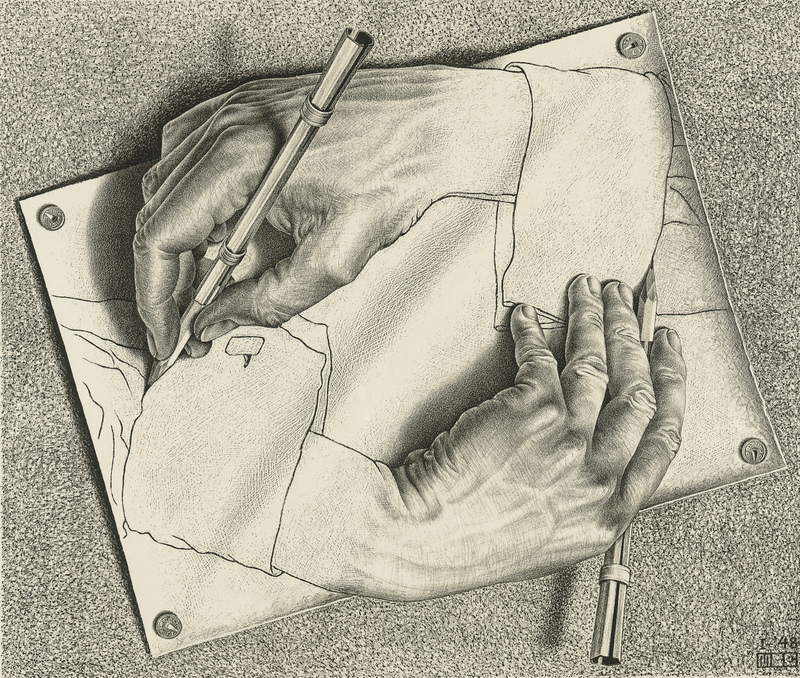 By the time he’d left Italy, Escher had produced over 200 prints. To add some perspective, he only produced around 350 in his entire career. The pieces produced during this period are black and white prints which offer a unique perspective differing from the typical depiction of Italian scenery. The works reflect the artist’s need to reduce the subject to its essence and analyse it. In 1953, Escher and his family left Italy for various reasons, one being the rise of fascism. They moved first to Switzerland, followed by other countries. This marked a shift in focus for the artist, from the external world to his inner, imaginary world. During a trip to the Spanish city of Granada, he visited the Alhambra palace and fortress complex, an experience which seemed to spark his interest in main themes of his work such as “impossible” buildings, the concept of infinity, the repetition of form and interconnected geometries that gradually change shape. Escher’s post-Italy work features stairs without a beginning or end, flying birds which blend together like day and night, and surreal worlds which seem like a dream or optical illusion. “Escher’s works are small, two-dimensional pieces that sit on the wall, but nendo’s works exist in the three-dimensional world so they physically take up more space. “Escher plays with the three-dimensional world in his flat-sheet paper, whereas nendo plays with two-dimensional ideas in the three dimensions. For more information on Escher X nendo: Between Two Worlds, visit the NGV’s website. This story appeared in the Thursday January 17, 2019 edition of Il Globo. Roberta Vitiello is a journalist at Il Globo, specialising in stories of interest to the Italian community in Australia. We wanted to try to bring a contemporary inflection to the display of Escher’s work. It’s more of an experience that is hard to put into words.